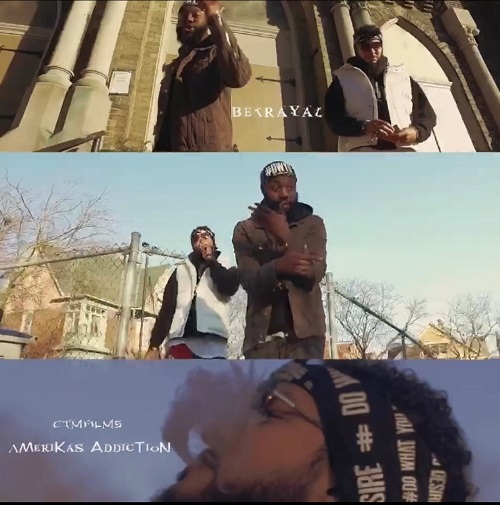 Milwaukee, WI – Hip-Hop duo Amerikas Addiction is releasing their first music video of 2018 entitled “Betrayal” from their upcoming album “Finish Em” (release date of 2/27/18) which is for pre-sale on all major streaming platforms. The song is produced by P. Beezy and the video was directed by CTM Films. The video link is below with other important information about Amerikas Addiction. Official performing artists at A3C 2017 Music Fest & Conference on the Square Space Discovery Stage in Atlanta, GA. Recipient of 2017 Swisher Sweets Artist Grant in Atlanta, GA.
Partnered with Wiz Khalifa’s in house producer (RMB Justize) to create EP entitled “FOUR” which was released on the Midwest’s top hip-hop site Fake Shore Drive. Partnered with top hip-hop freestyle app – Rap Chat for a freestyle rap contest that had over 200 plus submissions. They have over 20,000 fans on the app. Performed at and wrote for the Worlds Biggest Music Festival – Summerfest in July of 2017, which draws over 1 million music fans annually. Amerikas Addiction is an all-encompassing Hip-Hop duo based out of Milwaukee, WI that consists of members: David Kelly and Joshua Scarver. Operating under the motto “Do What You Desire,” the group has released several different projects to date and independently built a strong following of “addicts” worldwide through social networking and grass roots promotion (over 100 women have #DWYD or #DoWhatYouDesire tattooed on them). The fellas of Amerikas Addiction are known for their diversity in their talents. They have been casted and seen on hit TV show “Empire” Season 2 & 3 as extras in some scenes. They also have a podcast show on the GryndFestRadio entitled #DWYDSoundRadio, which features signed and upcoming hip-hop artists. Joshua Scarver is also a force in giving back to the children of the community, running a yearly successful toy and book drive that collects thousands of items for abused and neglected children in Milwaukee. Driven by their motto and priding themselves on being real and different, Amerikas Addiction is well on their way to getting the entire world hooked. The post Amerikas Addiction Presents: “Betrayal” Video @amerikasaddict @pbeezybeats @ctmfilms appeared first on East Coast Digital Radio.